We provide 24-hour service on any brand of heating and cooling equipment, as well as free evaluations of existing equipment and free estimates on new systems. 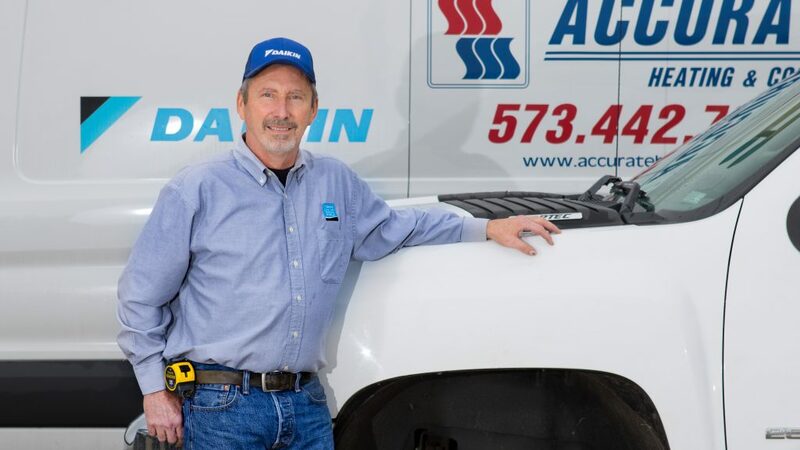 Clarence “Woody” Woodard founded Accurate Heating and Cooling in the late 1970’s with the goal of providing customers quality heating and cooling services at an affordable price. Woody built our great reputation for honest and reliable work. When he retired in 1999, he handed the reins to our current owner, Jim Gerhardt, a lifelong mid-MO resident. If you are looking for quality workmanship, prompt service and top-of-the-line customer care, Accurate Heating and Cooling is the right company for you. We offer free estimates, 24-hour emergency service and the professionalism you expect from a reputable business. Contact us today to schedule service with a member of our team!